The independent Children's Dental Health Project (CDHP) works to end early tooth decay — the #1 chronic condition affecting toddlers and teens. As you consider your donation, here's some of our impact in 2015. The Children’s Health Insurance Program/CHIP was extended, preserving affordable dental care for 8 million+ kids and 400,000 pregnant women. The Centers for Medicare & Medicaid Services — with support from CDHP — released state strategies for reducing early dental disease. 11 states are working for the oral health of pregnant w omen and infants in a HRSA initiative supported by CDHP and partners. CDHP analyzed how to reduce early tooth decay and lower Medicaid costs. Our eight social media campaigns reached networks that don't traditionally focus on oral health. Our Twitter storm on oral care for pregnant women reached 11m accounts, while #healthliteracymatters reached 2.2m. Help CDHP advance solutions for kids and families that make the best use of public dollars. 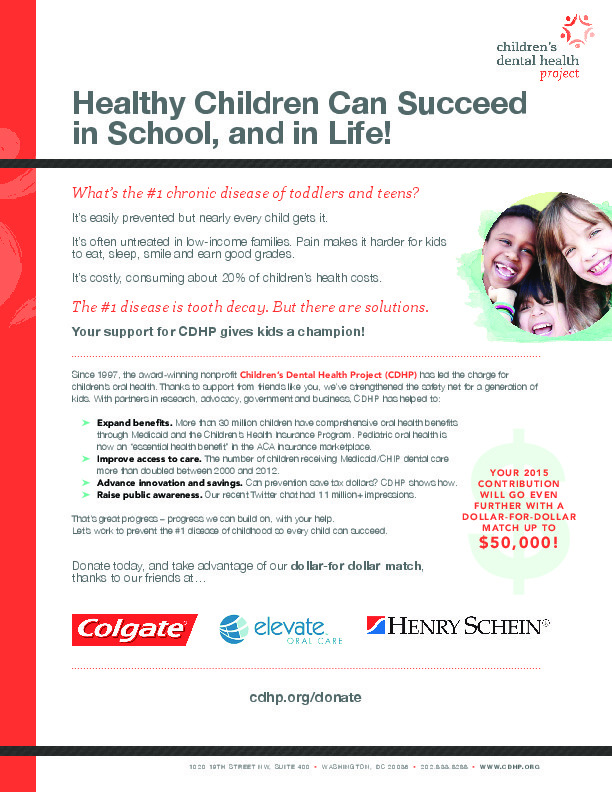 Your 2015 gift to CDHP will be matched dollar-for-dollar, up to $50,000, thanks to our friends at Colgate, Elevate Oral Care and Henry Schein Cares Foundation. Please make your tax-deductible donation today.